2015 is destined to be a big year for Irish DOP John Conroy with a trifecta of impressive international television shows airing in the New Year. 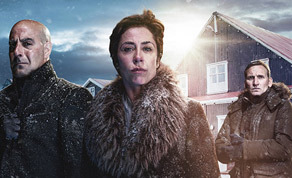 First up, there is the Sky Atlantic show ‘Fortitude’. Starring Richard Dormer and Stanley Tucci, the show tells the story of a violent crime occurring in the gorgeous backdrop of a quiet town in Iceland. Next up is all eight episodes of series two of the BAFTA-winning police procedural ‘Broadchurch’ which will also air in January 2015 with John currently working on series two of the Sky Atlantic series ‘Penny Dreadful’, which is filming at Ardmore Studios. Here, IFTN talks to Conroy about shooting on glaciers, following on from other Irish DOP’s to work on ‘Penny Dreadful’ and the importance of work ethic and not giving up in the DOP game. IFTN: Can you tell us about your work on ‘Fortitude’,‘Penny Dreadful’ and ‘Broadchurch’? What was your first job in the industry and what was your training/education? What do you enjoy most about being a DOP? What do you consider the greatest talent you possess as a DOP? Describe your typical working day and the equipment you use. What DOP’s would have influenced you? What Irish film or TV show do you wish you could have worked on? What films and TV shows did you enjoy growing up that may have encouraged you to work in the industry? What’s the difference between working on an Irish production and working on an international production for you? What advice would you give to anyone wishing to get into cinematography?